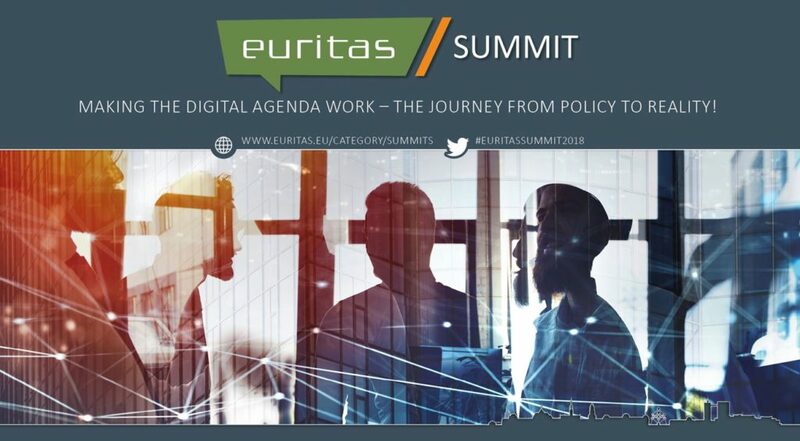 Representatives of the European Commission, EU member states, and public ICT professionals are meeting today at the Euritas EU Digital Summit 2018, to discuss the challenges between policy making and the technical implementation of European ICT regulations. The summit is organised by Euritas, the European Association of Public ICT Service Providers, in Brussels. The theme of the summit is “Making the digital agenda work – The journey from policy to reality”, since its main goal is to bridge the gap between policy making and implementation. All member states have to comply to EU regulations, such as the General Data Protection Regulation (GDPR), the Electronic IDentification, Authentication and Trust Services (eIDAS) and the upcoming Single Digital Gateway Regulation (SDGR). During the summit, representatives of European public ICT service providers will give insight into the implementation status of these regulations, the challenges encountered and lessons learned. Participants will discuss for example how to provide cloud services in accordance with the GDPR requirements, what the specific national approaches and status of implementing the eIDAS regulation are, and the importance of creating a user-centered approach for the Single Digital Gateway. The keynote speaker is Dr. Carl-Christian Buhr, Deputy Head of Cabinet of Mariya Gabriel, EU-Commissioner for Digital Economy and Society. He will address how ICT regulations relate to policy goals of the European Digital Agenda. Other speakers include Andrea Servida (Head of Unit “eGovernment and Trust” at DG CONNECT) and Willem Debeuckelaere (Deputy Chair of the European Data Protection Board). Please see the Euritas programme for more information. Euritas – the European Association of Public IT Service Providers – is the voice and network of public ICT service providers within Europe. The main objectives of Euritas are to share knowledge, to stimulate networking and collaboration, to jointly participate in ICT projects and to consult EU ICT policies. Over 80 public ICT service providers from seven European countries are currently represented in the network through individual or associations’ membership. The EU Digital Summit 2018 is the second major conference hosted by Euritas after a Conference in 2015 on public sector innovation, cross border cooperation and ICT challenges faced by the public administration in Europe.